Surf Lakes Holdings Ltd is an Australian company that is developing a totally new kind of wave-making technology using concentric waves. Our technology will be capable of producing a variety of waves that closely mimic natural ocean waves. Furthermore, because of the way Surf Lakes works, not only will it have the lowest energy cost per wave compared to other technologies, but it will be capable of producing up to 2,400 surfable waves per hour. Surf Lakes™ goal is to bring surfing to the masses around the world. Surf Lakes owns all IP globally and is planning to license the technology to licensees in various regions or countries around the world. Surf Lakes also oversee the construction and commissioning of each facility, then monitor and maintain it. Licensees will be responsible for marketing, management and day to day operations for their venue. Surfing is an exciting sport/pastime which is growing in popularity around the world. However, it is limited in accessibility, such that less than 1% of the world’s population have ever tried surfing. Of those who have not tried it (99% – more than 7 billion people), more than 65% of those surveyed (possibly 4.8 billion people) would love to learn. So how do we help the world access quality waves? The highest wave productivity in the market, allowing masses of people to surf at the same time. Simultaneous variety of waves (8 different types), allowing people of all abilities to surf at the same time. Shoreline swimming areas, allowing large number of swimmers and bodysurfers to participate, as well as surfers, at the same time. The largest sized waves when required. Energy efficient wave production, allowing operators to profit from the waves, as well as food & beverage and other entertainment or development around the lake. These elements, plus more, position Surf Lakes as a very unique and incredibly exciting opportunity. Our motto is “Everyone Gets a Break”, so we invite you to help us make this a reality. Surf Lakes works by using a large wave generator, positioned at the centre of a large man-made lake. The bathymetry (bottom contours) of the lake have been specifically shaped using sophisticated CFD computer modelling, and contain 8 separate breaks around the perimeter. The wave generator produces a single large concentric wave which radiates outwards. When this wave intersects each reef, a wave breaks and runs the length of the reef before dissipating on the shoreline. Up to six waves sets can be run with a short break in between. The waves will vary in size from 1m (3ft) to 2.4m (8ft) face height, catering for beginner to advanced surfers simultaneously. 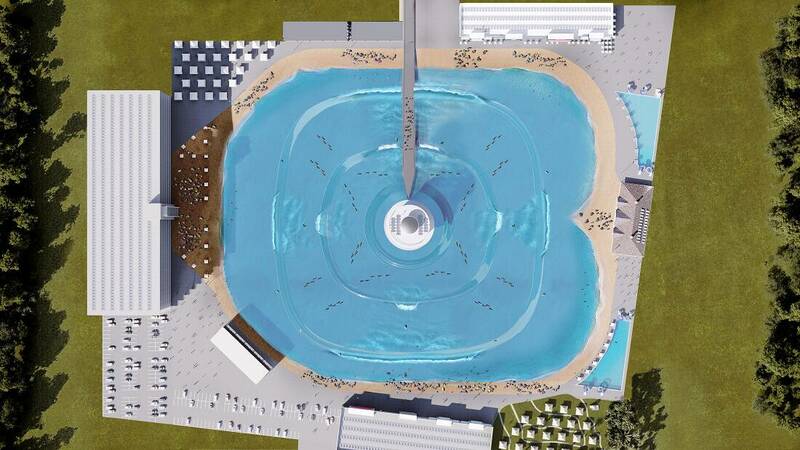 Above: Artists impression of completed commercial Surf Lake. Above: Top-down view showing the eight separate breaks. Surf Lakes representative will be in touch to discuss your inquiry.